I was in Sabah last week and hence, the lack of update. I notice that most of their eating places have huge signs that say, “serves no pork”. So, most of the places we had our dinner have no pork dishes. We ate seafood most of the time except for this one morning when we were at the Pasar Tamu in Jalan Gaya. We saw this shop (I have forgotten the name) with a lot of customers so we joined in. They have koay chiap which is a herbal soup brewed with all parts of the pig and duck. Normally, in Penang, I ate koay chiap which is the pieces of rice flour, very much like koay teow. But due to communication breakdown, 😛 we got a bowl of handmade noodle in the koay chiap soup. Well….it wasn’t impressive but the noodle is nice. Anyway, our meal was cut short because midway, my eldest son phoned and told us our little one was awake. It was only 6.30 am in KK and the sun was shining brightly already. That’s the part that I have problem getting used to. So early, so bright and before I can remember to watch the sunset, it is already dark. Foochow koloh mee. I have heard so much about koloh mee and how the bloggers from East Malaysia were raving about it. Finally, I got a chance to taste it eventhough it is not from Sarawak but Sabah. Nevertheless, it is totally different from our West Malaysia kon-lou wantan mee. It is really nice because the noodle has the eggy flavour, smooth and the pork tastes different but good. I wish I had more time to sample other places koloh mee but this is probably the only hawker meal we had in Sabah. Overall, I would say that Sabah offers some really nice food. Sabah is the only state in Malaysia that I haven’t been to and now, I can claim that I have set foot on every state in Malaysia. If you ask me to rate the local hawker foods in Malaysia, I will rate it a 3rd, after my famous Penang and #2 is Ipoh, Perak. The mee that you blogged about seems to be from a stall run by Sarawakians. 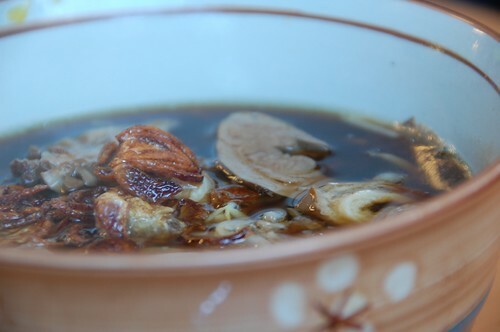 Kway Chiap is a sarawakian noodle. 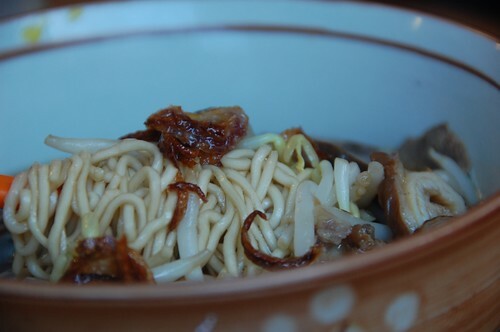 And Sabahan’s Kon Low Mien is not like the Foochow’s version of Kampua Mee (Foochows are generally from Sarawak). Sabah’s Kon low mien tend to have more sauce and generous with the sliced meat (you may ask for extras like chung kien and wantan). FYI, I am a Sabahan who happens to be working in Sarawak. 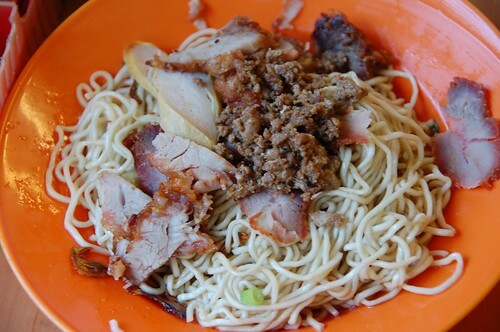 wish i can do this food here in Manchester..i love this..
Singapore has this Kolo Mee that made headlines recently. I only tried it few weeks ago.. I still like my Penang wanton me more.. this Kolo Mee, tastes somewhat like the Sg Bak Chor Mee. I still prefer Bak Chor Mee over Kolo Mee, but i think some prefer the Kolo Mee more. But true the kolo mee noodles has a rather al dente texture which is nice. here in tawau,u could find either serve with or no pork kolo mein. nor the muslims could make the taste as better as chinese seller. wonder if u already taste the kolo mein seafood soup. great taste for vegetarian or those who bore wt the red meat.Rasa Sedap restaurant is the one u shoud visit. located in the middle of the town where u could only travel by foot frm ur hotel. King Park Hotel is a suggestion. If you all happen to be visiting Beaufort, drop by at Membakut Small Town. You could try the koh lon mien next to the vegetable market. Ask the local where is kedai mee si gumpiak and kedai mee si konong, they know it. Its rather cheap thou and very nice. I enjoyed it. It is a must.